So first things first I’m joining Kimberley at Cosmos and Cleome for her Thursday’s Feature and highlighting one of the little treasures which don’t seem to care much about a few sunny days and a bit of heat. 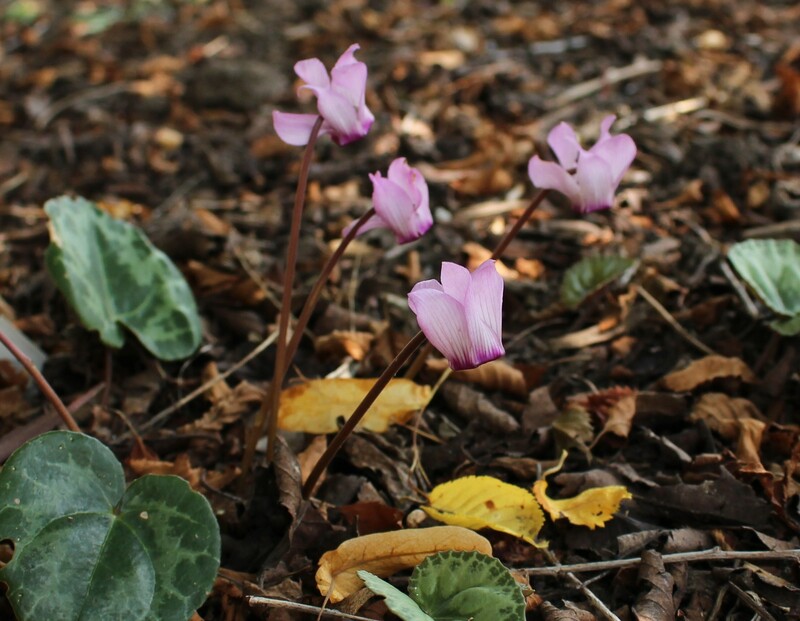 This week’s plant is that hardiest of hardy cyclamen, Cylamen purpurascens. Blooming this week in the dry shade beneath the weeping cherry is Cyclamen purpurascens. I like the slight streaking and chunky flowers of this one. 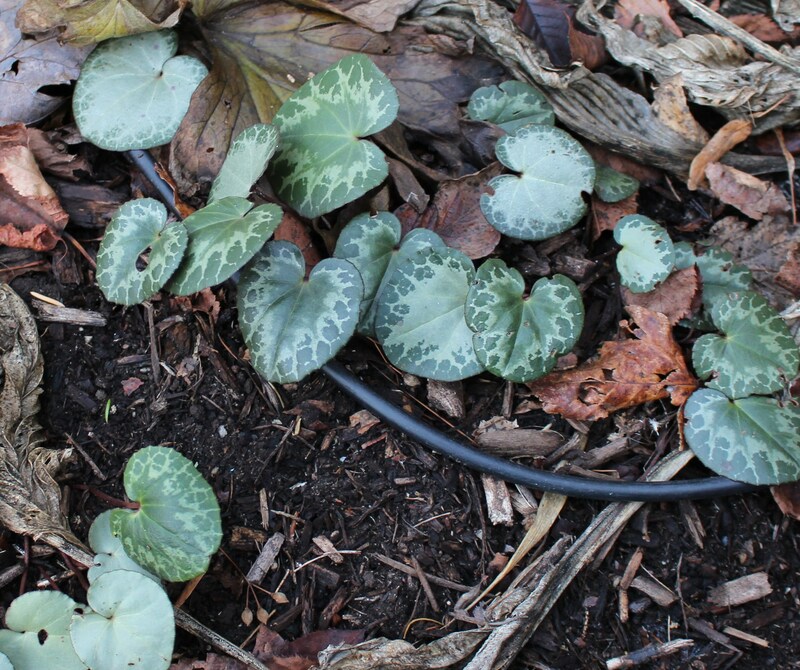 Besides being a hardy plant ((the cyclamen society’s website lists this plant as tolerant of temperatures down to -4F… and my own plants have easily endured -9F without significant snow cover) this plant also has the distinction of retaining foliage year round. Even now during he worst of summer the beautifully marked and mottled foliage lights up the gloomiest of dry shade locations. Cyclamen purpurascens has the typically beautiful foliage shared by many of the cyclamen family, and the range of patterns is always amazing. It also has the distinction of blooming now. The flowers won’t blow you away until they come by the hundreds (which I’m hoping for someday), but for now the little splashes of color are a welcome relief for summer weary shade gardens. A more typical Cyclamen purpurascens flower with pink color and open, twisted petals. For more expert information and growing requirements I’d recommend the cyclamen society’s website, but from my own experience I find this cyclamen to be a little fussier and much slower growing than the others and also a plant which actually seems to welcome a good freeze in the winter. Seedlings which I protected indoors really sulked until I threw them outside for the coldest months. Mine were raised from seed, but honestly this is one cyclamen I’d have no problem buying as a plant. Germination takes a year, it’s another year before they do any serious growing, another two or so years for a bloom if you’re not the most attentive grower, and then even the seeds take over a year to ripen before you can try for the next batch. We’re not getting any younger, so save yourself a few years and buy a couple plants from John Lonsdale at Edgewood gardens. For a plant which you probably won’t find anywhere else $12 a pop seems like a bargain to me and I’m a relatively cheap guy. When you’re done with that give Kimberley a visit and see what else is on the radar this Thursday (or practically Friday as I look at the clock). There’s always something interesting to be had and I know you won’t regret it! This entry was posted in cyclamen, perennials, summer, thursday feature and tagged cyclamen, hardy bulbs, summer flowers, thursday's feature. What a lovely little plant, love the patterned leaves, must look for this one over here as I have plenty of places that I think it will like! So pretty, this is one I haven’ t got. Well done growing it from seed. I like growing plants from seed that take a long time to grow and bloom. It makes me feel smug. Is this one scented? I love feeling smug, and it’s so easy to forget about the losses along the way when that first peony blooms! Good in dry shade, you say? Hmm . . . my lasagna bed is in dry shade . . . hmm . . . there are empty spots up there . . . hmm. . . . Of course the next question for me is whether anything will eat it. Congratulations on your success with these, Frank, and thanks for joining in! You know I’ve never noticed anyone munching on these but the wildlife pressure here isn’t as serious as what you get. I wonder if voles would eat them, I suspect they might, but probably not the bigger furry things. Surprising this is blooming now. They look too delicate. Lovely. It always surprises me that there is a cyclamen hardy enough to survive outdoors. 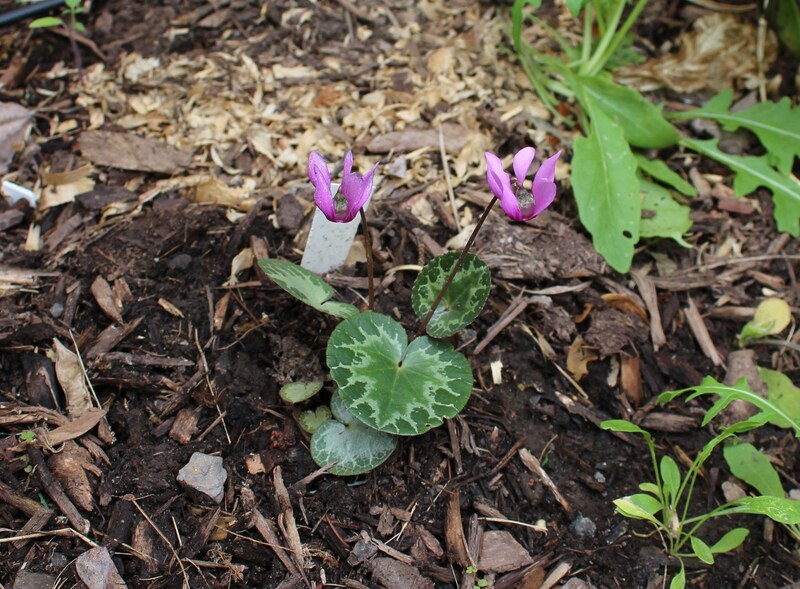 Reading about your Cyclamen purpurascens reminded me to check what my own were doing. They are also in bloom but are not as vigorous as yours. I expect they are too much in the shade. Some are doing well, but I was looking the rest over and they’re not all thriving here either. Hopefully they seed a bit and settle into a spot they like more, it’s just I don’t want to wait another ten years for them to take off!